Malachi Moshe Rosenfeld, 26, who died Tuesday from wounds sustained in Monday night's terrorist shooting attack, laid to rest. Malachi Moshe Rosenfeld, 26, was brought to rest Wednesday in his hometown of Kochav Hashachar, in the Binyamin region north of Jerusalem. Late Tuesday afternoon, Malachi succumbed to wounds he sustained in a terrorist shooting attack near the village of Shvut Rachel the previous night. Hundreds of friends and relatives are taking part in the funeral, including Education Minister Naftali Bennett. Thirteen years ago, on March 29, 2002, Naftali's eldest brother, Lt. Yitzchak-Menachem Rosenfeld, 22, was killed in a jeep accident in the Tze'elim Stream, in the Judean Desert. He was a pilot in the IAF. Yitzhak-Menachem was named after his uncle, Sergeant Yitzhak-Moshe Rosenfeld, who was also killed during his military service, in 1978. Malachi's parents are among the founders of Kochav Hashachar. The father is a clarinet player, and the mother is a social worker. They have seven children, beside Yitzchak-Menachem and Malachi Moshe. The Al-Qassam Brigades, the armed wing of Palestinian terror group Hamas, has claimed responsibility for the terror attack near Shvut Rachel. 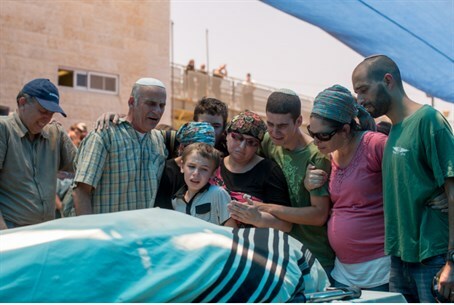 Four Israeli civilians were injured in the terror attack, among them Malachi Moshe Rosenfeld, who succumbed to his wounds on Tuesday evening. The Al-Qassam Brigades asserted the attack was part of "a series of quality operations" carried out by the group's members in recent months, and that the attackers opened fire at point-blank range on a car of "settlers" before managing to escape safely. On Tuesday, sources in the IDF and the Israel Security Agency (ISA or Shin Bet) admitted that a terror cell appears to be at large in the Binyamin region north of Jerusalem, although they did not say if the cell had any connection to Hamas.